Courage, diplomacy, love, and conspiracy make for an action-packed adventure in a little-known past. This third instalment of the series continues Radisson’s adventures with the Jesuits and the Iroquois. Mastering the Iroquois language and customs, Radisson leads a mission of French traders and Jesuits to Onondaga in an attempt to build alliances and trade for much-prized furs. But it quickly becomes apparent that the Iroquois are bitterly divided over whether or not to welcome the French and their missionaries among them. Radisson’s skills in diplomacy are tested, as he tempers the ardour of the Jesuits and calms the arrogant and distrustful French traders, and cultivates friendships with the Iroquois who favour peace. With their lives at stake, Radisson and Father Ragueneau devise a secret plan to escape. During the ordeal he also learns that peace is worth far more than war, a principle that will guide him in the future. 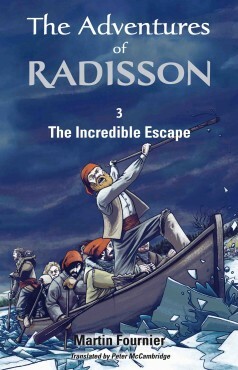 Based on true events as recounted by Radisson, The Incredible Escape, Volume 3 of The Adventures of Radisson will thrill readers young and old, recounting the early history of North America in modern accessible language. For background see Vol. 1 Hell Never Burns and Vol. 2 Back to the New World. Martin Fournier is an award-winning storyteller and writer but also a historian who has specialized on Pierre-Esprit Radisson and New France. He lives in Quebec City. Peter McCambridge is a professioinal literary translator living in Quebec City. Peter won the 2012 prestigious John Dryden Translation Prize awarded by the British Comparative Literature Association.